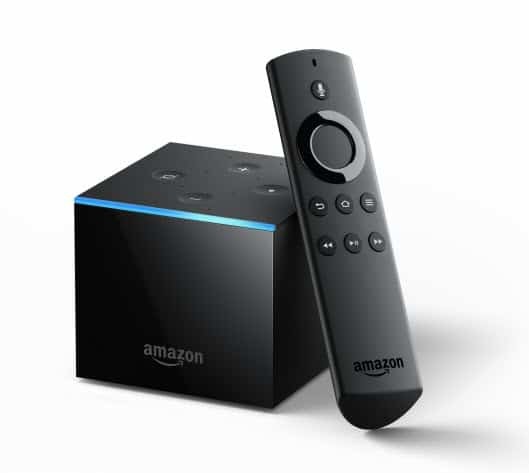 Amazon is launching the Fire TV Cube which is a device that combines its Amazon Echo with its video streaming Fire TV set-top box. The Fire TV Cube looks like a cubed Echo Dot, but it includes all the features of its Fire TV 4K and Echo smart speakers. There are four echo buttons at the top and a blue light that lets you know when Alexa is listening. Inside it has eight far-field mics so it can hear your commands from across the room and a built-in speaker for Alexa’s responses. It also has a 1.5 GHz quad-core processor, 2 GB RAM, and 16 GB of internal storage space (8 GB more than the 4K Fire TV dongle). It supports 4K Ultra HD and HDR-10 video and Dolby Atmos audio. The Fire TV Cube has built-in 802.11ac dual-band MIMO Wi-Fi and Bluetooth connectivity. While it has built-in Wi-Fi it also comes with an Ethernet adapter for a wired connection. In comparison, the 4K Fire TV only has built-in Wi-Fi and its Ethernet adapter is sold separately. Amazon also ships the Cube with an Infrared extender cable and Alexa remote control. If you’re already invested in the Amazon ecosystem the Fire TV Cube should be an easy device to get used to. You can already use Alexa with the remote, but this offers a hands-free experience. But, you can already have that if you use your Echo with Fire TV for hands-free control. But if you have been on the fence about getting an Echo or Fire TV, this is a good option to consider. The regular MSRP is $119.99 but Prime members can preorder one for just $89.99 but you need to act quick as that special ends tomorrow. Also, if you purchase and register the Fire TV Cube by July 1, Amazon will give you a $10 credit for Prime Video. The device will officially be shipped to everyone starting June 21st.